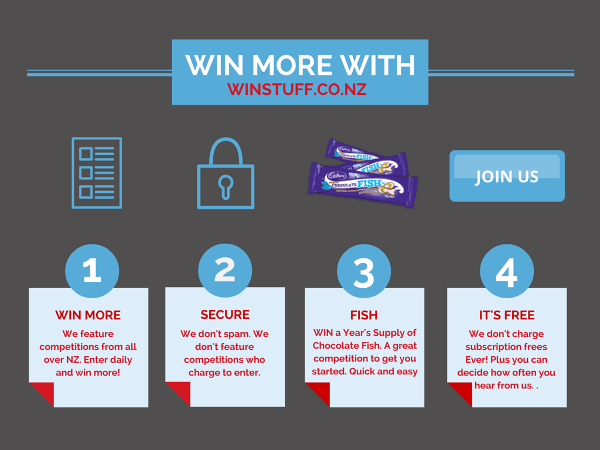 Winstuff.co.nz is New Zealand’s competitions website! We’re like a ‘search engine’ for competitions in New Zealand. How can I enter the competitions? Every competition has different rules. Some require you to simply “like” a page or submit your email address. Others require you to answer questions or to come up with a new slogan for example. Some competitions are hosted on other sites – what’s the deal here? We want to feature all the competitions that are currently running in New Zealand. That means 95% of the competitions (we run a few ourselves) are run by external companies that we have no control over. What happens when I Join Winstuff.co.nz for Free? You get the option to join our daily, weekly or one off special newsletter. We will also create you a free account that you can use to add competitions yourself and make a note of which competitions you have entered (thanks to our competition tracker). I just saw a great competition on another site I think you should feature. How can I add it to Winstuff.co.nz? Easy! Head over here and fill out the simple form and we can get it added to the site. How do you lot make money? We do various things to pay our bills. We use third party advertising networks to serve you relevant advertisements, we get paid a commission by some of our partners, and some other stuff too.